The definitions are clear, but they rarely give enough detail on how they apply to a particular IT setup. The Wikipedia article is pretty informative, but we prefer referring to the NIST document about audit trail. This relatively short document from more than 20 years ago covers many the necessary details. 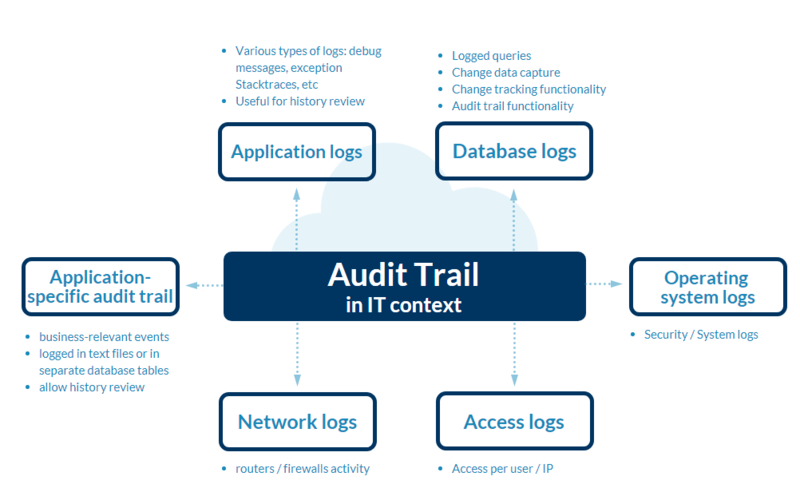 The audit trail is an important concept, and has very practical implications. It is a widely researched topic, but in practice many IT setups lack sufficient audit trail capabilities. Partly because the risks are not immediately obvious, and partly because it is a technically challenging task. With Sentinel Trails the task becomes much less challenging and we hope we can contribute to an overall improved security landscape. This entry was posted in Log Collection, SIEM and tagged access logs, application logs, audit trail, audit trail requirements, database log, event logs, linux logs, microsoft logs, network logs, operating system logs, server logs. Bookmark the permalink.